May 20, 2014. It comes as no surprise to working families that New York State’s tax system is fundamentally unfair. Low- and middle-income workers pay, on average, a much higher share of their income in state and local taxes than the highest income earners. According to analysis by the Washington, D.C.-based Institute on Taxation and Economic Policy, the 40% of New York’s tax filers with the lowest incomes pay at least 10% of their income in state and local taxes and the 20% of households in the middle of the income distribution pay nearly 12%. The wealthiest 1%, on the other hand, pay less than seven percent of their income in state and local taxes. Taxpayers don’t have to accept this fundamental unfairness. New York State enacted several tax cuts this year, but the beneficiaries were mostly high-income households, large corporations and banks. These tax cuts will make it hard for the state to adequately fund core priorities like local education aid or aid to struggling local governments, but New York should improve the fairness of its tax structure by expanding its Earned Income Tax Credit. The Earned Income Tax Credit (EITC) primarily helps low-income working families with children by reducing their income tax liability. The EITC is often seen as an incentive for work since it helps offset the cost of payroll taxes paid by individuals and other costs such as child care so that parents can work. The amount of the credit increases with the number of children up to 3, and increases as earnings from work increase, reaching a maximum amount at earnings of $13,650 in 2014. EITC benefits phase out entirely at about $50,000 for a family with 2 or more children. The credit is refundable so that if the amount of the EITC exceeds income tax liability, the beneficiary gets a check for the difference. New York State provides an EITC pegged to 30% of the federal credit, and New York City has an EITC at 5% of the federal credit. By all accounts, the EITC has been wildly successful, increasing workforce participation and helping 6.5 million Americans escape poverty in 2012, including 3.3 million children. Research shows that the children of EITC recipients are healthier, do better in school, are more likely to attend college, and earn more as adults. And it is the rare public program that enjoys broad support across the political spectrum. The maximum federal EITC amount in 2014 for a family with 3 children is $6,143. At 30 percent of the federal EITC, the maximum NYS EITC amount in 2014 will be $1,843. About 1.6 million New York State low- and moderate-income households receive the state EITC. These EITC families include over two million children. About 900,000 low- and moderate-income families with one million children receive the City EITC. By increasing its EITC to 40% of the federal benefit, New York State would effectively increase EITC benefits by one-third for all recipients. The average NYS EITC would rise from about $690 to $920, an increase of $230. For a married household with three children the maximum benefit increase would be $614. An increase to 50% of the federal benefit would increase the EITC by two-thirds for all recipients. In that case, the average NYS EITC would rise to $1,150, representing an increase of $460 over the current state EITC credit with the maximum for a married three child household rising by $1,229. Such an increase would provide a much-needed boost to the incomes of 1.6 million low- and moderate-income families. Not only would this lift the neighborhood economies of struggling communities around the state, it would also improve the well-being and life chances for two million children. In addition, an EITC increase would make up for the fact that the state excluded these low- and moderate-income families from the Family Tax Relief Credit enacted in 2013 that provided a refundable $350 credit to families with incomes from $40,000 to $300,000 and at least one child under the age of 17 who owed state income taxes. This likely excluded all families receiving more than a minimal EITC benefit. Increasing the EITC is the clearest, most direct way that New York can increase the progressivity of its state and local tax structure. This would be a welcome contrast to the various other tax changes enacted in 2013 and 2014. 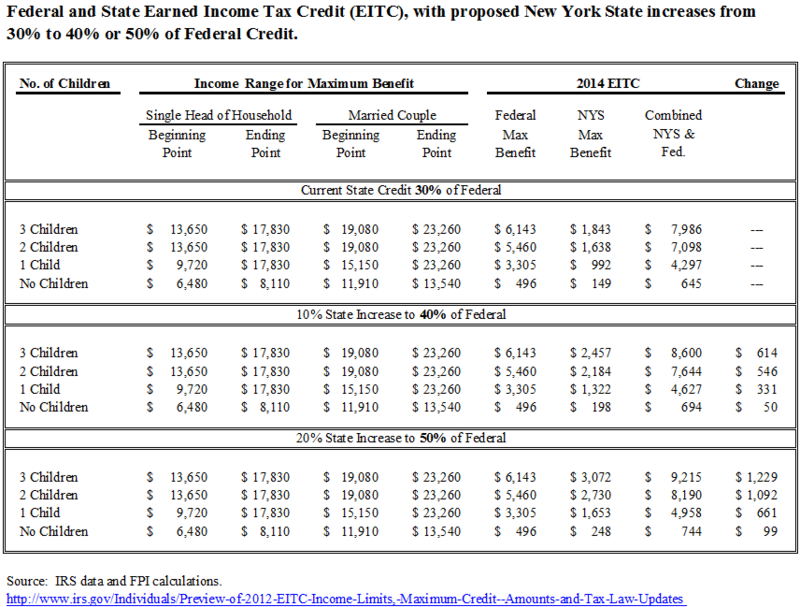 Were NYS to increase its EITC to 40% of the federal credit in 2014, the estimated additional cost would be $370 million. An increase to 50% from the current 30% would increase the cost by an estimated $739 million. In a new report, Improving Tax Fairness with a State Earned Income Tax Credit, the Institute on Taxation and Economic Policy (ITEP) makes a powerful case for states to raise their Earned Income Tax Credits.